It’s gloomy today and the rain falls steadily as I write. The last of the snow has finally melted and the daffodils are peeking up through the earth. My favorite magnolia tree in the backyard is filled with velvety buds, patiently waiting for her all too brief moment of blossoming. Change is afoot, both outside and in my kitchen as we transition to the early days of spring. We are a ways out from fresh strawberries and rhubarb here in Nebraska, but the displays in the market tell me that somewhere not too far from here they are already bountiful. 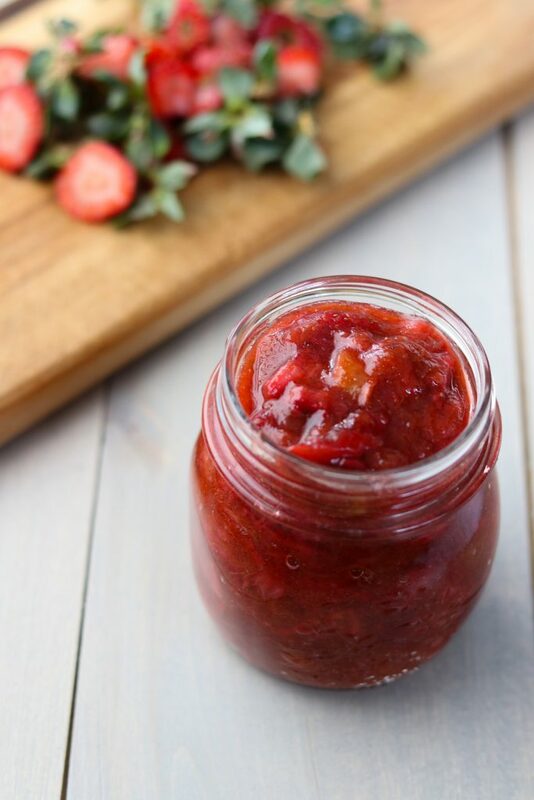 I can’t think of a better way to kick off this season of rebirth and renewal than with this Roasted Strawberry and Rhubarb Compote. Think of it as that perfect accessory that you can put with just about anything and elevate it from ordinary to extraordinary. Like a favorite scarf or necklace but edible. A batch of this compote will keep for at least two weeks in the fridge and will cheerfully adorn just about anything you choose to pair with it. 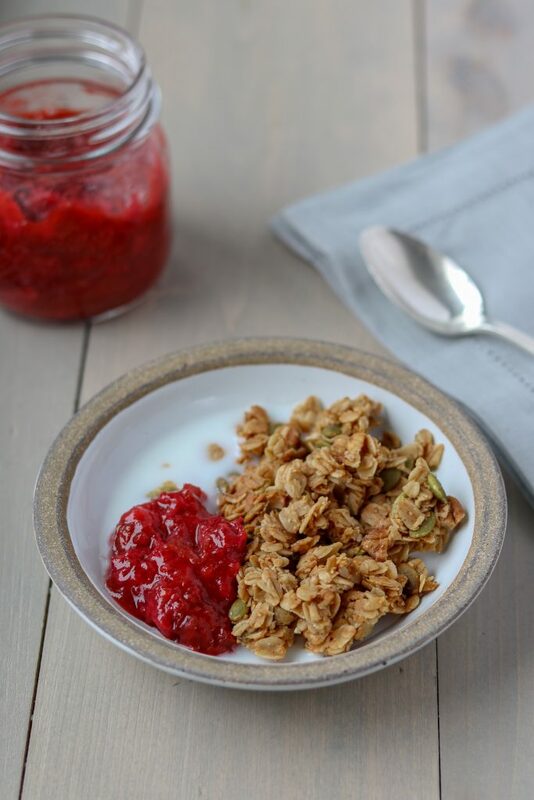 Like Strawberry Rhubarb Crisp for breakfast! You get the idea. Enjoy these early spring days, my friends! They are fleeting. Soon it will be hot and humid and we will long for this in between season of fresh earth, cloudy skies and new beginnings. A cheerful spring topping for just about anything! Combine all ingredients except vanilla bean in a 9 x 13 baking dish. Using a small knife, slice down one side of the vanilla bean lengthwise so that it opens like a book. Using the back of the knife, scrape the black seeds from the inside of the split vanilla bean pod and place in the baking dish. Add the pod as well. Stir everything together. Roast for 20 minutes. Remove from oven and stir mixture. 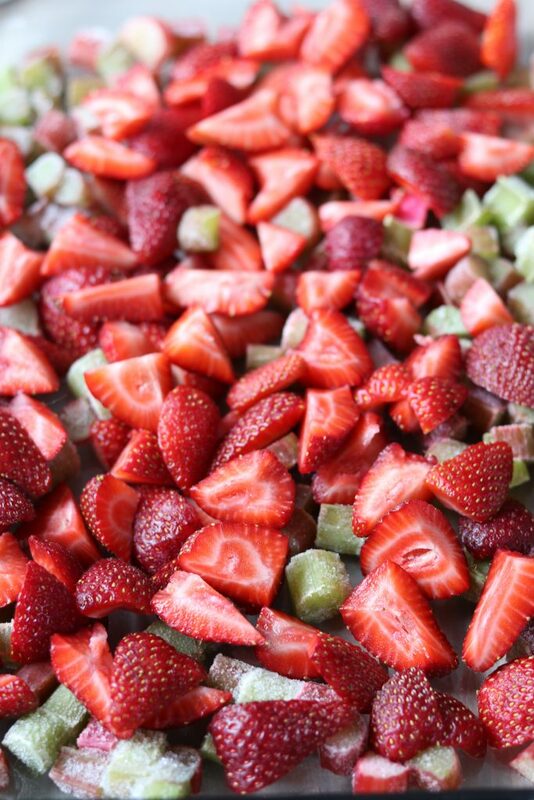 Return to the oven and roast for another 20 minutes or until fruit is bubbly, extremely soft and falling apart. Remove the vanilla bean pod. Using a potato masher or the back of a fork, lightly mash the fruit mixture until it is a jam-like consistency. Allow to cool. Store in an air-tight container in the refrigerator for up to 2 weeks. I associate carrot cake with springtime. Even though I can easily buy carrots 12 months out of the year, NOW is when my thoughts turn to carrot cake. Does it have something to do with Easter? Bunnies (and by extension their beloved carrots)? I honestly don’t know, but last week, right on schedule, the craving hit and I set out to develop a recipe for an easy, delicious carrot cake. Something to know about me as a baker….I lean towards the simple and rustic. You are not likely to find me in the kitchen painstakingly assembling a three-tier layer cake embellished with piped frosting and elaborate decor. While I admire this kind of work and will gladly eat it, it’s just not my personal style. I like a cake that is easy to put together for an afternoon fika treat, something I can pair with a strong cup of coffee around 4 pm without having to do too much planning ahead. Something to know about me as a carrot cake lover….I like to keep it basic. Just carrots, spices and that tangy cream cheese frosting. You can keep your pineapple, your coconut, your chopped nuts. I want a carrot cake that is the essence of simplicity. When I began developing my own version, I started with a recipe for Danish Carrot Cake from the Scandinavian baking bible, The Great Scandinavian Baking Book by Beatrice Ojakangas. It was an all butter recipe, which seemed like a good idea (many carrot cakes are made with vegetable oil rather than butter), and it was a simple 8 inch square cake that looked like it would come together quickly. Unfortunately, it wasn’t quite what I was looking for. Pale in color, light on carrots and spices, it hardly seemed like a carrot cake. Back to the drawing board. I began researching why so many carrot cake recipes have oil rather than butter. It turns out that oil has more fat than butter (butter is part water), and the oil gives the cake that moist, almost dense quality we associate with carrot cake. So canola oil in, butter out for this next round. I also doubled the amount of carrots and swapped out a portion of the regular sugar for dark brown sugar to improve color and texture. This version was much better. I was happy with the texture but the cake still lacked flavor. For my next round, I doubled the spices and the salt (the contrast of salt is essential for bringing out the sweetness in baked goods) and swapped out a portion of the canola oil with brown butter. You know brown butter….unsalted butter that has been melted over low heat until it becomes nutty and golden brown? It makes a wonderful addition to baked goods (try it in chocolate chip cookies), and I was hoping that it would add a little richness and flavor without compromising the texture of the cake which had so greatly improved when I swapped oil for the butter. Success! This final version boasts a dense, moist crumb, plenty of carrots and just the right amount of richness and spice. And don’t forget the cream cheese frosting! It’s absolutely essential in my opinion. As is a good, strong cup of coffee to go with it. 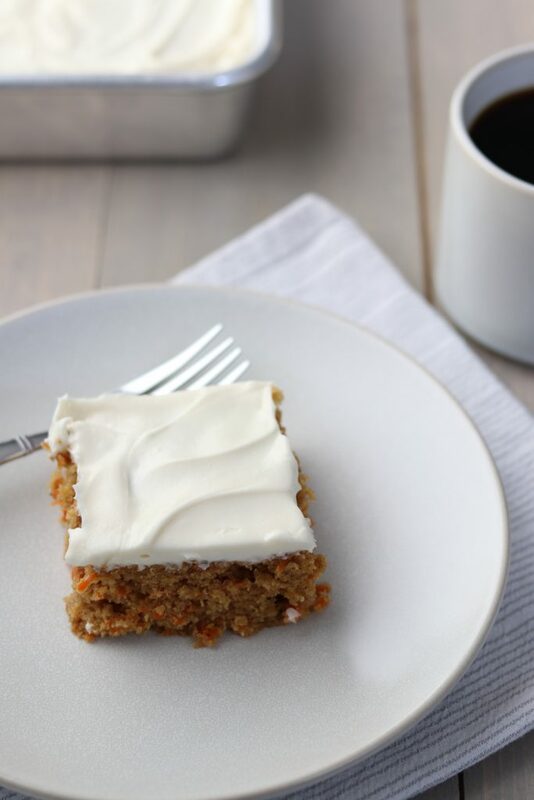 A simple, perfectly-spiced carrot cake with luscious cream cheese frosting. Preheat oven to 350 degrees. Grease and flour an 8 inch square cake pan. Place butter in a medium skillet (preferably not nonstick or cast iron so that you can more easily see the color change) and heat over medium low heat, swirling the pan frequently. Once the butter has melted, continue to cook over medium low swirling the pan frequently until the butter has a nutty aroma and is golden brown in color. Don’t walk away from the stove! Brown butter can go from perfect to burnt in a matter of seconds. Transfer brown butter to a bowl to cool. Combine flour, baking powder, salt, cinnamon and nutmeg in a medium bowl. Whisk together and set aside. Combine eggs, brown sugar and granulated sugar in a large bowl and whisk until fully combined and no lumps of sugar remain. Slowly whisk in oil followed by cooled brown butter and vanilla extract. Keep whisking until the mixture is emulsified and cohesive. Add dry ingredients to wet ingredient and stir with rubber spatula until just a few streaks of flour remain. Fold in carrots until mixture is just combined. Using a rubber spatula, transfer cake batter to prepared pan. Bake for 30-35 minutes or until a skewer or toothpick poked into the center of the cake comes out clean or with a few moist crumbs attached. Set cake aside to cool. Meanwhile, make the frosting: Combine butter and cream cheese in work bowl of a stand mixer. Beat with the paddle attachment on medium high until fluffy and fully combined, scraping down the bowl with a spatula as necessary. Reduce speed to low and add powdered sugar. Once it is combined with the butter and cream cheese, add vanilla extract and return mixer speed to medium high and beat until the frosting is light and fluffy, stopping to scrape down the sides of the bowl once or twice. Once cake has cooled completely, spread frosting on top. Serve. Grate your carrots on the large holes of a box grater or using the grater attachment of your food processor. If you don’t want to bother browning the butter, you can substitute 1/4 cup addition canola oil for butter. It’s important that your butter and cream cheese be room temperature it you want a smooth, luxurious frosting.